Visitors take 2-3 seconds to determine whether your webstore is good enough to be explored or if it's time to close the tab! If the page doesn’t load quickly or render well, they abandon it. Making them stay is a task easier said than done. The design of your webstore is a major deciding factor for your E-Commerce success. Online retailers need to deliver an exceptional experience in many areas - a user-friendly interface, service proposition, site speed, genuinely valuable shopping features, integration across devices and secure transactions amongst others. 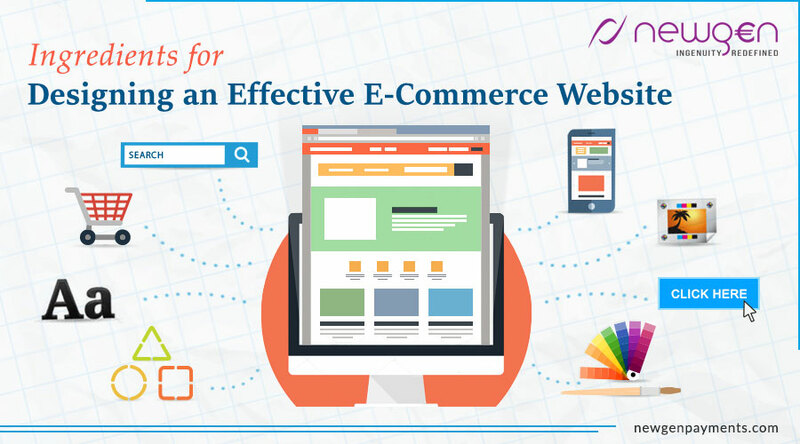 Read on to see how you can design a more effective E-Commerce webstore. The look and feel of your website should complement your brand and products. Here are a few suggestions which can help you increase web traffic and generate more revenue. Use the most appropriate colors for your webstore by analyzing your brand colors, products, and the target market. Use a well-suited color palette for your theme, for example: using pastels or black and white in the background for a fashion webstore will better highlight the goods on display. Once again, ensure that the color theme is elegant and doesn’t unnecessarily overwhelm your visitors. The prominence and positioning of the call to action buttons such as Learn More or Get Started are also crucial. They should have a defined shape and border. Having a contrasting color from the background will make it stand out and ultimately result in high conversions. The text should be straightforward and action-oriented. Use appealing typography that appropriately matches your branding and is easy to read across all devices. Some classics are ‘Helvetica’, ‘Open Sans’ and ‘Raleway’. Clutter hinders your communication with visitors. A well-organized and systematic website loads faster, is easy to navigate and helps you reach a broader spectrum of audience. Adding a detailed and comprehensive ‘About Us’ section lends authenticity to your online business and helps the customer relate to the brand. Displaying multiple high-quality photos, reviews and videos helps users to feel like they've "experienced" the product prior to purchase. Provide appropriate size charts for different products. Give them an idea of how big/long/wide your product is by comparing it to well-known items. For example: position your product next to a pencil when thickness is a selling point. Photos should highlight the details of your products and retain clarity, even when zoomed in on. Include instructional videos for the more complicated products. Search is often rated as the most frustrating part of customer experience on many E-Commerce sites. Search results should be accurate and bring up the most relevant products. Accidental typos and misspellings can also ruin search results. It’s important to pre-empt what mistakes visitors may make and provide suggestions quickly. It’s important to have comprehensive search options which allow users to intuitively find the products they want, by choosing prices, options, colors, sizes, models, etc. Highlight exclusive deals and hot selling-products in your search results. Providing customers with related products, bundles and recommendations will boost discovery and sales, e.g. for someone buying a dress, display matching shoes, bag or accessories to go with the dress. Ensure that you have a simple checkout process that removes unnecessary steps to efficiently guide customers to purchase the product. Make registration optional. If a visitor is forced to sign up for an account before they make a purchase on your site, you may lose this new customer. Provide photos, specifications and links for the items in the basket and a progress indicator to give shoppers visual indicators of where they are in the shopping process. Checkout pages should only ask for the most relevant information like delivery address and payment details, to save your customers time. Display the relevant security seals to show your customers that their payment information is secured. Sending out order confirmation emails will enrich the customer’s purchase experience. Include all the product details. Make customers comfortable with shopping on your site by accepting returns and offering free trials. Cross-device and cross-browser optimization is a necessity. Technology, trends and customer tastes will change, and so must you. Invest in testing and analysis of your webstore. It helps you to see where people abandon their carts or find it tough to complete their purchases. We enable you to easily create and design your online store with your brand.